‘A dance aesthetic with proper songs’ is how Delphic’s Matt Cocksedge describes his band’s musical outlook. Given that the Stockport-formed quartet Delphic (founders Cocksedge, Richard Boardman and James Cook, plus recently recruited drummer Dan Hadley) are touted as vanguards of the new Mancunian scene, that doesn’t seem a million miles away from the music their home city and its surrounding area was making two decades ago, when Madchester and the baggy sound was at the forefront of British popular culture. ‘It’s difficult to deny we’ve been influenced by Manchester, the city,’ says Cocksedge, ‘because obviously we’ve grown up around there, although we’re too young to have been to the Hacienda and all that. But I’d say we’re more aware of the music the city’s produced and respectful of it, rather than being directly influenced by it.’ While it’s possible to draw a more or less direct line back to New Order from Delphic’s music (check out the Peter Hook-style bassline underpinning ‘This Momentary’), their youthful, blissed-out electronic pop optimism belongs firmly in the present day. The Chemical Brothers and Daft Punk, says Cocksedge, are the kind of classic benchmarks his band aspire to. So let’s move on then. 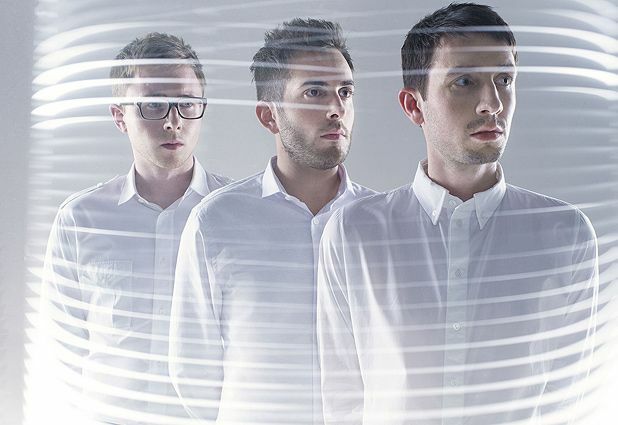 The rest of the world is something which Delphic have become intimately acquainted with since the beginning of the year, when their placing in the BBC Sound of 2010 poll and positive reviews for their debut album Acolyte stoked expectation levels for the rest of the year. Not bad for a band who formed less than three years ago, albeit one that welcomed Cocksedge and Boardman when they already had experience of playing music together right back to their schooldays. Speaking in late spring, a bleary Cocksedge is only just recovering from the jetlag incurred on a tour which would have seen the group whip around four continents, had the Icelandic ash cloud not postponed their flights to America. ‘Yes, there may be a small element of that too,’ he laughs, when questioned about the effect of late night touring revelry on the ‘jetlag’. ‘No, it’s been really tiring, but it’s also been quite an amazing experience. We’ve played Japan and Australia off the back of these songs we wrote in our flat in Manchester, you know? That’s pretty special.’ It doesn’t stop there, with this appearance at T being only one of nearly two dozen transcontinental festival dates coming up this summer. If we didn’t know better, we’d almost be tempted to put that down to a Northern grafter’s ethic. Delphic play the Futures Stage, T in the Park, Fri 9 Jul.